1. Put the buckwheat in a saucepan with the bouillon powder and 450ml water. Bring to a gentle simmer and cook for 7-8 minutes, until the buckwheat is tender (buckwheat overcooks quickly, turning mushy, so watch closely towards the end of cooking). Drain thoroughly, tip into a bowl and leave to cool. 2. Roughly chop the hazelnuts and add to the bowl with the salad onions, watercress, celery and cherries, and mix together gently. 3. Whisk together the balsamic vinegar, oil, honey and seasoning to make a dressing. 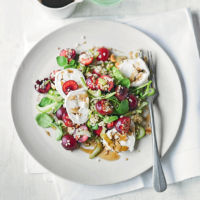 To serve, slice or crumble the cheese into the salad, drizzle with the dressing and gently toss together.